Today my new book, Decorated: Sublimely Crafted Cakes for Every Occasion, has officially been released in the UK, US and Australia! To celebrate, I wanted to share one of my favourite recipes and decorating techniques from the book and I also have a signed copy to give away. I love this dip-dye ombre look. Inside is a rose flavoured cake that uses mostly egg white, giving the sponge a pale shade which lends itself well to being coloured (check out the book for tips on how to turn this into a rainbow cake). The rose cake is topped with crystallised rose petals. This technique works with other edible flowers like violets and yellow primroses. As with using fresh flowers, the important thing to remember is that your rose petals should be pesticide free. 1. Remove the petals from the flower head, trying to keep them in one piece. Pick out the freshest looking petals. 2. Working in batches, brush a thin layer of egg white on to both sides of each petal and sprinkle over enough caster sugar to give each petal an even coating. 3. Set aside on baking parchment or a wire rack to dry with a crisp shell, uncovered, for several hours or overnight. Store at room temperature and use within a day or so of making. Preheat the oven to 170°C (335°F/Gas 3). Grease the cake tins and line with baking parchment. Using a stand mixer or electric hand mixer, beat the butter and sugar in a bowl until pale and fluffy. Add the eggs to the mixture a little at a time, until they’re well incorporated. Sift the flour, baking powder and salt into bowl. Add half of the flour mixture to the butter mixture and beat until just combined. Add half of the milk and the rose extract, continuing to beat, and then add the remaining flour and milk. Divide the mixture evenly between the prepared cake tins. Bake in the oven for 45-50 minutes, or until a skewer inserted into the centre of each cake comes out clean. Allow the cakes to cool for 10 minutes in their tins, then turn them out on to a wire rack and leave to cool completely. While the cakes are cooling, make the rose buttercream. Using a stand mixer or electric hand mixer, beat the butter for 3–4 minutes until pale and creamy. Add the icing sugar and cream and continue to beat for another 2–3 minutes until smooth. Add the rose extract gradually to taste. Level the cakes by cutting off the domed tops and split each layer in half so that you have 4 layers in total. Fix the bottom layer to the cake board or stand with a small amount of buttercream and spread with a generous amount of the buttercream. Add the second layer and repeat, and repeat again with the third layer, finishing with the final cake layer. Cover the cake with a thin layer of buttercream and chill for 30 minutes or until firm. Oo this sounds lovely! I don't have just one fav - it's nice to keep an open mind and try new flavours ;) Some delish ones I've had lately include cinnamon and maple syrup cake; earl grey and dark chocolate; cookies and cream cake with mascarpone icing. 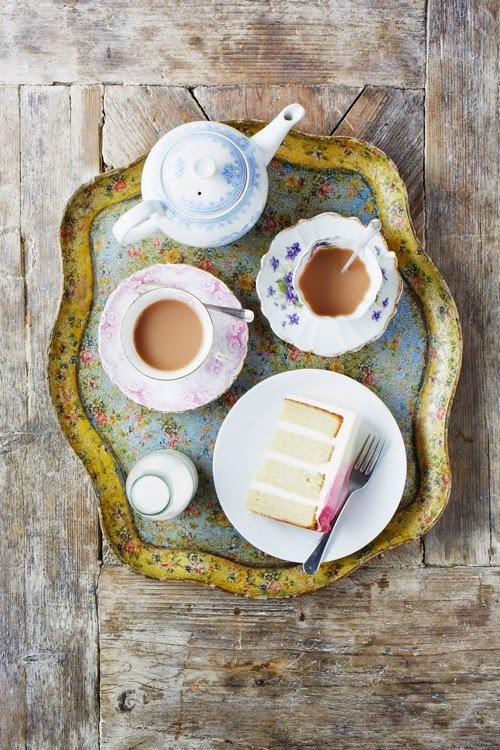 These photographs are so beautiful, I am going to get myself down to the nearest bookshop and get a copy of your lovely new book... so many pretty cakes! 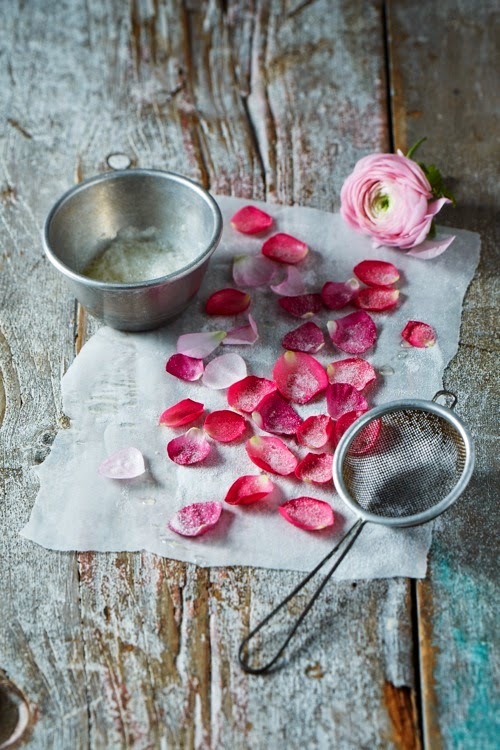 I love the idea of making your own crystallised rose petals - I will definitely have to try them at home. 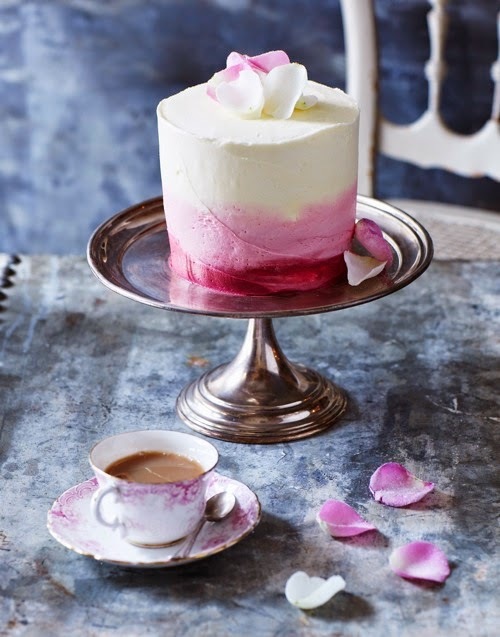 What are the rest of the ingredients for the Rose Buttercream? They seem to be cut off?